Daniel Tosh at Boston University. 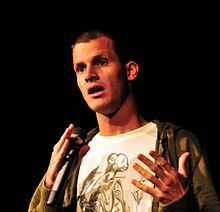 Daniel Tosh (born May 29, 1975) is an American stand-up comedian. Currently, Tosh hosts Tosh.0, a show showcasing internet video clips on Comedy Central. Daniel Tosh also had another stand-up special called "Daniel Tosh: Happy Thoughts". Tosh has released two albums, True Stories I Made Up, which was released on November 8, 2005 by Comedy Central and Daniel Tosh: Completely Serious, which was released on June 17, 2007 by Comedy Central. His Comedy Central TV show Tosh.0 premiered on June 4, 2009. ↑ "Daniel Tosh". Dead-Frog. Retrieved 2007-06-17. ↑ "Biography". DanielTosh.com. Retrieved 2007-06-17. ↑ Thompson, Rodney. "Jaguar Productions presents Daniel Tosh". Retrieved 2009-05-11. ↑ Wenzel, John. "Comedian Q&A: Daniel Tosh". The Denver Post. Retrieved 2009-05-11. ↑ Cuneo, Jessamyn (January 2007). "Over The Edge With Daniel Tosh". American Superstar Magazine. Retrieved 2007-06-17. ↑ "Push for Tosh at Comedy Central". Variety.com. Retrieved 2009-03-13. This page was last changed on 5 January 2019, at 01:00.